ISTANBUL, TURKEY and PALO ALTO, CA- Trendyol.com, the leading and fastest-growing fashion e-commerce company in Turkey, has announced that it has raised $26 million from Kleiner Perkins Caufield & Byers and existing investor, Tiger Global, to fuel continued growth and scale operations. Notably, this is Kleiner Perkins Caufield & Byers' (KPCB's) first investment in Turkey -- raising attention for both Trendyol.com and the rapidly-expanding Turkish Internet and e-commerce ecosystem. KPCB has invested some of the world's most respected technology companies including: Google, Amazon.com, Twitter, AOL and Zynga. Trendyol.com highlights the unprecedented Internet and e-commerce growth market in Turkey, as well as company growth statistics in this infographic: www.trendyol.com/trends. While the West may have experienced an e-commerce boom a decade ago, countries further east such as Turkey are now just moving through that economic and distribution cycle. Turkey has 35M Internet users (source: IWS) and ranks as the fifth largest Internet population in Europe. What makes Turkey unique as an emerging market is its high credit card penetration rate of approximately 60 percent with 46M credit cards (source: BKM), and the third highest online engagement in Europe (source: comScore). In terms of social networking, Turkey is quickly becoming one of the most connected countries in the region, locking in fifth place for the greatest number of Facebook users globally, eight for Twitter and first for FriendFeed. "We're particularly thrilled that Kleiner Perkins could see the market opportunity for e-commerce in Turkey and Trendyol.com as leading the way," Demet Mutlu, founder and CEO. "Trendyol.com's mission has been to revolutionize fashion in Turkey and make it accessible to all: for those who don't have the time to shop; the brands or stores in their cities; and/or for those who cannot afford high retail prices. The new financing will be used for key growth initiatives including enhancing our customer service, investment in operations, increasing member acquisition and further accelerating our growth within Turkey as well as other markets -- all to deliver the best customer experience." Founded by Demet Mutlu, Trendyol.com launched its consumer e-commerce site in March 2010. In merely 16 months, the Company scaled to four million members (or one in nine Internet users in Turkey), a large scale distribution and logistics ecosystem and over 350 employees. The management team includes Founder and CEO Demet Mutlu (Turkey's leading female entrepreneur), Managing Partner Begum Tekin as well as a strong executive bench. "KPCB is very excited about Trendyol.com's growth, quality of user experience, innovation in the fashion industry and its first-class team of entrepreneurs," said Aileen Lee, partner at Kleiner Perkins Caufield & Byers. 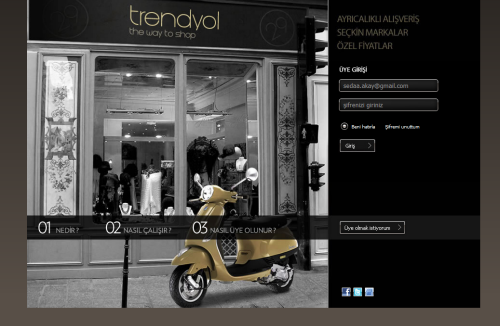 "Trendyol.com represents the new era of Internet innovators delivering on the promise of the social Web. We look forward to helping the Trendyol.com team continue to grow the business and are optimistic about its continued success in this high growth market," continued Mary Meeker, partner at Kleiner Perkins Caufield & Byers. "What attracted us to Trendyol.com was its grasp of how to leverage economic trends in Turkey such as high credit card penetration rates and localized marketing," said Lee Fixel, managing director of Tiger Global Management. "Trendyol.com is also smartly applying crowdsourcing to its business model and state-of-the art logistics to deliver on product delivery cycles which engender a loyal customer base."